It’s a bit of an Oprah-ism but sometimes the most rewarding experiences come when you least expect them. In early August, we rocked up in the one horse town of Khuraburi, just inland from the North Andaman coast, with the half-hearted idea of finding something to do in the area. As most of the (tiny) town was closed due to the unfortunate fact that it was the middle of the monsoon season, we felt instantly thwarted. Within five minutes of arriving on the desolate 100 yard strip of grubby restaurants and petrol stations that answered to the description of Khuraburi town centre, Jamie was questioning my decision to come here; within 10 minutes he questioned my sanity. And within 15 minutes it had started to pour with rain, which flooded our shabby guesthouse lodgings and further ruined our moods. However, all was not as it seemed. Despite the low season (ok, monsoon) weather, and the fact that the most happening thing happening in Khuraburi in the three days we were there was a funeral, there were saving graces. The first was the people – not just the friendly locals who welcomed us ‘falang’ into their coffee shops and karaoke bars (and made us sing! ), but two groups of unexpected Thai-resident westerners: a team of journalists working for a German magazine and workers at a Khuraburi-based NGO called Andaman Discoveries. The second saving grace stemmed from the first. Getting chatting with the journos, here to cover a story on the local sea gypsies, I decided to follow suit and track down a story I was interested in – about a village of floating bungalows built and run by the inhabitantsof a fishing village that was totally destroyed in the tsunami. That led me on to the Andaman Discoveries team. Although the project I wanted to visit wasn’t running in the low season, the lovely staff at Andaman Discoveries did invite me to go on a press trip to Ban Talae Nok instead, another tsunami-hit village that now opens up its homes to visiting tourists. 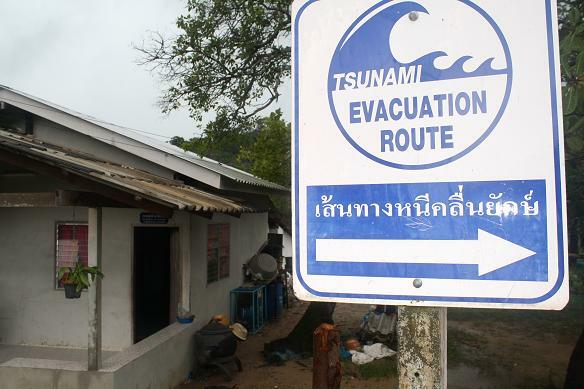 Despite the fact that few of us in the UK were directly affected by the tsunami, it was one of those events that we all remember vividly – where we were when we first heard about it, and how horrible it was as the grisly events unfolded. After the dust settled and everybody was accounted for (or not, as it happened) the sea had claimed more than 220,000 lives. It decimated the coastal communities of Sumatra, Sri Lanka and Thailand and left more than a million people without homes. For the residents of Ban Talae Nok, a fishing village on the west coast of Thailand, the impact was devastating. Half the village was swept away and a quarter of the population was lost to the sea. Sadly, this included 16 primary school children and their teacher who had been practising for a new year show in the shore-front school hall. As NGOs flooded into the area from states worldwide, the people of Ban Talae Nok were given a helping hand by the North Andaman Tsunami Relief (NATR) fund – a locally founded charity – who helped them to mend their fishing boats and regain their livelihood. As income for the many families who had lost their breadwinners NATR also introduced the idea of eco-tourism. It trained young people to organise community-based tourism projects in their villages (including Ban Talae Nok) and set up work collectives making traditional handicrafts that visitors could help with. 5 years on and the village has a thriving community tourism business. 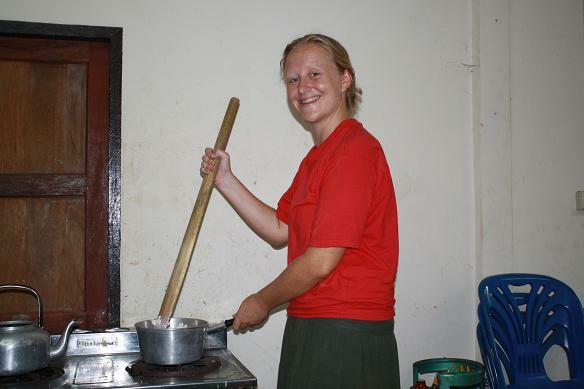 Visitors, mostly from Britain, mainland Europe and the US, spend anything from two days to a week living in the village and helping the community by going fishing, teaching English, reforesting the local mangroves or helping to make soap and sarongs. Although there are other short-term ‘voluntourism’ projects in Thailand, the village of Ban Talae Nok stands out. It has just won the silver Kinnaree Award for ‘Outstanding Performance: Best Eco-Tourism Attraction’ in the 2008 Thailand Tourism Awards. This is particularly commendable if you consider that before the tsunami no one in the village had even met a westerner. Although bookings are still managed by Andaman Discoveries (the new guise of NATR), the village is otherwise totally self-run. Local guides, now experts, even visit other villages and advise them on their own homestay projects as part of the recently founded North Andaman Community Tourism network. My visit to the homestay and night in one of the houses showed me how valuable tourism is as a resource here. I only spent a night here but was made to feel very welcome (one woman shared her betel nut ‘paan’ with me, a family their home), and I was told again and again ad embarrassment, how honoured they were to have the opportunity to share culture with tourists. I loved my time there. 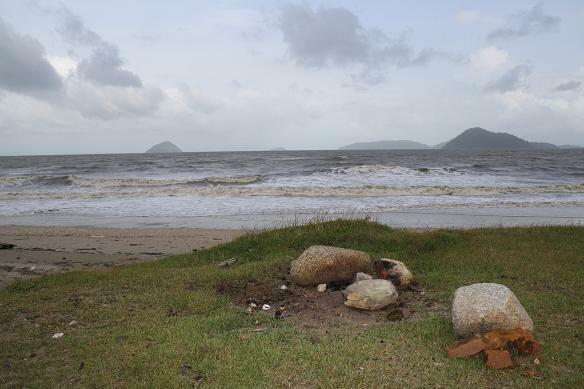 The horrors of the tsunami have faded but not been forgotten – by the shore a monument stands to those lost and another stands in front of the rebuilt school, which is now half a mile away from the shore and wisely up on a hill. The people do not dwell on this aspect of tourism though – this is about action and community-based projects. On my visit, I joined in with some weaving, which I was poor at, and some soap making, which I loved. Andaman Discoveries provides guests with a translator to bridge the language barrier. Thank god: I tried out my ‘nit nai’ (small amount of) Thai and otherwise grinned like a monkey and asked halting questions through the interpreter. The resulting conversations provided much insight and laughter on both sides. Guests are invited to bring pictures from their lives to share with the families of the village. The villagers, like all Thais, ask a lot of questions about the way we live; the concept of skiing is particularly baffling for them. I ask how they like having tourism in their village. My guide tells me that he and the villages feel honoured and that after the tsunami they might have given up hope but for the good people of the world who sent relief. He says that the fact that outsiders take an interest in the village means that the villagers take more pride in it too. Through the interpreter, the lady who teaches me to make shapes from the soap for sale tells me that the soap-making collective is also a very good thing. Twenty of the women of the village work here periodically (as well as visiting guests) and the soap is sold to hotels as far afield as Japan. She is 44 years old and had two children but she lost one in the tsunami. He was only seven. I don’t know how she can smile at all but the Thai sense of fun has returned to the village now, along with a hope they didn’t think they had five years ago. For somewhere as remote as Khuraburi (and Ban Talae Nok is further out on a limb from there) organisations like Andaman Discoveries who can encourage people into the area are invaluable. More and more projects are springing up that allow all kinds of tourists to spend a short time on their holiday helping others and experiencing local culture, which can only be a good thing. Vouching for this different experience – the joy of really seeing a culture, working and eating and living in a Thai village even for a short time – all I can say is that for me it was as enriching and humbling a time as I have ever had on my travels. And it taught me that you should always look more than once at a place; you never know what you might find there.